Jack and Frances Krall’s initial introduction to the world of pedigree dogs was via Great Danes in which breed they produced several outstandingly successful Champions. When they became involved in Giant Schnauzers in the early 1980’s however, their JAFRAK affix set a benchmark for quality in the breed. Through a carefully thought out breeding programe which involved the importation of several key Giants they incorporated the cream of European and American bloodlines into the Kennel and the results spoke for themselves. The JAFRAK Champions have accounted for many major wins, including several Pup of the Year qualifiers and Group winners culminating in the Crufts 2008 Supreme Best In Show Champion Jafrak Philippe Olivier. 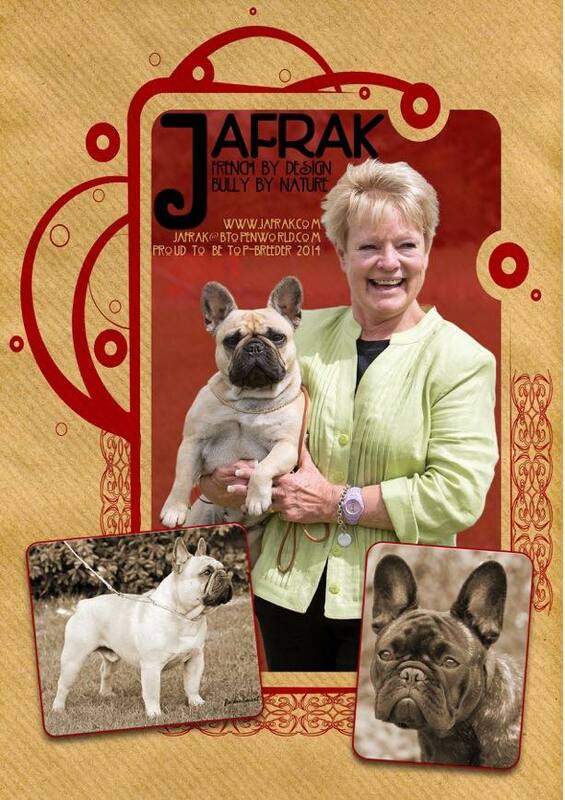 And it is worth noting that many of the winning Jafraks have been exhibited by relatively new people to the breed and indeed to showing dogs. As with most dedicated breeders, Jack and Frances Krall enjoy nothing more than seeing other exhibitors flying the JAFRAK flag, and they are unswerving in their loyalty to ‘their’ owners, offering after sales service that cannot be rivalled. Jack and Frances are now concentrating on producing and showing their French Bulldogs, although having owned and bred Frenchies for the last 30 years they have not been exhibited as The Giants took up most of their time, however there are already two home bred Champions in residence, three Champions abroad and as with the Giants they are happy to see other exhibitors showing and winning with their stock. Jack & Frances Krall Have been awarded the Kennel Club Assured Breeder Award Of Excellence.